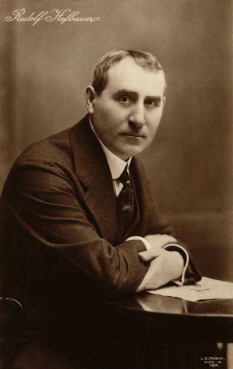 The actor Rudolf Hofbauer joined the film business in 1918 and he impersonated numerous roles in the first years. To these productions belong "Die Geige des Tommaso" (18), "Die Liebe des Van Royk" (18), "Mazeppa, der Volksheld der Ukraine" (19), "Miss Sarah Sampson" (19) and "Das Tor der Freiheit" (19). He continued his film career at the beginning of the 20s and he took part in the silent movies "Die Tophar-Mumie" (20), "Die Dreizehn aus Stahl" (21), "Die schwarze Pantherin" (21) and "Kaddisch" (24). After a longer interruption Rudolf Hofbauer appeared in his only sound film "Die Koffer des Hedrrn O.F." (31).